Enter your name and email below to register, and receive your copy of the book "101 Book Marketing Ideas". I started eBookIt.com back in 2010, because, as an author, I was frustrated with the lack of options for e-publishing. We have helped thousands of clients publish their books over the years, and we are looking forward to helping thousands more. Back in 2004, when I tried to publish my own book (my first book), the process was a nightmare. I spent months sending my manuscript to literary agents and publishers, who I desperately hoped would find my title and book description interesting enough to at least consider perusing my manuscript. As it turned it, my title Year To Success was not "get rich quickly" enough, or as one publisher put it, "perhaps you can change the title to something like 'Success in 7 Easy Steps' since readers are not going to want to wait a whole year for success." Here is where I could easily go on a rant about humanity's desire for instant gratification at the expense of genuine achievement, but I won't. After months and thousands of dollars in mailing, printing, and packaging costs, I found a book distributor who helped authors self-publish books, which essentially means not needing someone else to believe in your book as much as you. But this was only the next phase in what would be a long series of expenses and headaches which included high-volume printing requirements, warehouse stocking fees, return fees, monthly report fees, and the list goes on. I spent over $30,000 trying to publish my own book and only made a fraction of that back. Fortunately, the process of publishing your own book is better today. Much better. The Better Question: How To Self-Publish a Book? No longer does publishing your own book have the stigma it once did—mostly due to the changes in the industry including improved technology, author's access via the Internet to self-publishing resources, and the procedures that allow self-published authors to get their books in bookstores without requiring a publisher. And perhaps the general move to self-publishing has occurred because sensible people realize that making roughly 50% of the book sale price is a heck of a lot better than making pennies for every book sold while the publisher gets rich off the work of the author. I would wager that the author E.L. James from the 50 Shades of Grey franchise is darn glad she once Googled "how to self-publish a book" rather than "how do you get a book published" or even "how can I find a publisher to publish my naughty books who will keep 99% of the revenue but still leave me with enough to buy a cup of coffee?" You no longer need to spend over a year and tens of thousands of dollars struggling to get your book in the hands of readers. When you self-publish a book, you do absorb more of the risk. That is, you are wagering your own money that your book will do well. The good news is, the amount you need to wager can be next to nothing if you have the knowledge, skills, and time to do most of the work yourself. If you do have a little money to invest, there are companies (like eBookIt.com) who can do just about everything but write your book for you. The basic rule of thumb of book self-publishing: The more money you are willing to invest, the easier the process. 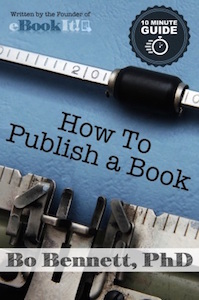 This guide will not go into details about finding a literary agent or publisher willing to pay you up front for the rights to your book, but it will provide you with step-by-step instructions on how to self-publish a book. Spoiler alert: the top-level answer to the question "how do you get a book published" is that you do it yourself, but below we go into the specifics. This is an easy step, as most authors will have their book in some electronic or digital format already unless the book was written long ago before the age of personal computers. An "editable, formatted, electronic/digital" copy is a file format where the text can be copied and pasted to another document. The most common files that fit this description are Word documents (.doc or .docx), .rtf files, Mac Pages document (.pages), and Open Office (.odt) files. This also includes some .pdf files that were created from one of these source docs rather than scanned in. Scanned documents interpret all words as images, and those documents need to be run through optical character recognition software (OCR). If all you have is a hard copy of your book or manuscript, you will need to scan in each page and run the scanned document through OCR software. If you have a basic scanner it should do the trick. You can find free or inexpensive OCR software on the Internet. If you would rather have someone do this for you, services such as Bound Book Scanning can do this for you for very little cost. Edit, Proofread, & Grammar Check! Print out your book and read it out loud. You tend to catch more when the book is printed rather than being displayed on the screen, and reading it out loud helps with finding skipped words and other errors that tend to be overlooked when reading silently to yourself. Use your computer's "Text to Voice" feature. Most operating systems have the feature that allows you to select text and have it read to you in a very human-sounding voice. Ask friends or family to read your book and note any possible errors. You will need to have some good friends! Use Grammarly.com. This is an amazing service that catches 10 times as many errors as leading word processing software. And their basic service is free! Use a professional editor or proofreading service. We offer this service at eBookIt.com. If you are publishing a book full of errors, it will likely get very poor reviews that can be disastrous for sales. Take this step seriously! If you are creating an ebook cover, paperback book cover, or a hardcover jacket with flaps, the complexity of the projects varies greatly. Ebook covers are fairly simple whereas creating covers for print books require precise fit into printer-provided templates that is usually best left to a professional graphic designer. But since we can thoroughly cover ebook image requirements with a few bullet points, here is what you need to know to create a great ebook image. Images should be created at roughly 1659px wide by 2500px tall to cover the new requirements from most of the vendors. Barnes and Noble require a smaller image. Images should not have a border (i.e., a thin line outlining the cover image). Images must be RGB (not CMYK). Images must clearly show the title and author as it appears in the metadata when the book is submitted to the retailers. Images must be good quality and not pixelated. There are services that can design stunning ebook images for you for relatively little cost. I generally suggest to all of our clients and prospects to start with an ebook rather than a print book when self-publishing a book. This is because the process is both significantly easier and less expensive. If your ebook generates some decent revenue, then it would be worth investing in a print book. There are exceptions to this: one common example is professional speakers who sell the majority of their books through "back of the room" sales. But for most of us, starting with an ebook is the way to go. You can do it yourself by following the guidelines in this short, 11-page document I created: A Short Guide to Preparing Your Files for eEbook Conversion. There are services that can do this for you. This is one of the primary services we offer at eBookIt.com. See our eBook Conversion, Distribution, and Promotion Package (you can choose conversion only if you like). Formatting for print is significantly more difficult, and takes a bit of technical knowledge as well as design capabilities. We suggest having a look at Ingram Digital's File Creation Guide. There are services that can also do this for you. See our Print On Demand services. Publishing your book in audio follows some very different guidelines, and is outside the scope of this document. But you can see our page on this if you are interested. To publish your book as an ebook, you need to convert your editable, formatted document to the common formats required by ebook retailers and their respective ebook reader devices. The good news is, there are many free resources available that do this for you. The not-so-good-news is that these do an adequate job at best that is sometimes acceptable to authors on a tight budget, but unacceptable to those who demand professional standards for their self-published book. Most auto-conversions require some post-conversion tinkering to get it right. Download and install the free Calibre software. This software takes a little getting used to but is very powerful. You upload your original formatted document, choose the format you want to convert it to, then let it do its magic. You will want to then download Sigil, the free software for editing ebooks. This will allow you to clean up and fine-tune your document so it is retail ready. Use a professional service. See our Ebook Publishing Service. If you choose another service make sure they don't just run your document through Calibre or some other automated software. Based on my experience in this industry, I would estimate that 98% of all ebook sales are made through the top half-dozen or so retailers. Physical books are a little different in that many authors sell their own books through their own website. The point is, don't waste your time opening up accounts with ebook retailers who are not likely to sell any of your books. an extra set of eyes to proof your content, book description, author bio, etc. See our Ebook Publishing Service. And that is how to publish a book, or more specifically, how to self-publish a book. Now that you have a good overview of the process you can look into what is required for each step and decide if you want to do that step yourself or use a service that will do it for you. No matter which direction you go, you will save both time and money by publishing your own book rather than going "old school" and hoping some publisher will see the value in your book that you see. We work with authors and publishers to format and convert books into ebooks, and distribute them to all the major ebook retailers including Amazon, Apple, B&N, Google Play, Ingram, Kobo, Scribd, Baker and Taylor, and our own bookstore. We then work with our clients to promote their books to the media and the public. As great as ebooks are, as an author, there is nothing like seeing the result of perhaps years of work materialize in a physical book. Holding your book in your hands is one of the greatest feelings of accomplishment any author can experience. This is just one reason print on demand books are as popular as they are. Imagine your book enjoyed by listeners all over the world, distributed by Audible, the world's leading retailer of digital audio books, through outlets such as Audible.com, Amazon, and iTunes. With the help of eBookIt.com, we can make this possible. People really do judge a book by its cover. Right or wrong, many readers associate the quality of the writing and the content with the quality of the cover. Don't risk readers passing on your book because of an unattractive cover. Imagine having your very own industry expert right there for you for all of your publishing needs. Ryan Levesque, eBookIt.com co-founder has worked with thousands of our clients since 2010 and is now focusing exclusively on providing a more personal level of service to those clients who want services beyond our standard offerings through the Publishing Concierge Service. As founder of eBookIt.com, I have a privileged perspective of what works when it comes to book marketing and promotion, having worked with thousands of authors over the years. In this FREE course, I share this information with you.